Baby play mats are probably one of the most versatile baby toy products we can buy for our babies. Not only can these mats be used in a variety of creative ways, but they also offer some development benefits to babies. In this article, we will give you tips on how to find the best baby play mat and help you in your decision to enrich your baby’s early development. Before we go ahead and look at a few products, it would be appropriate to discuss how something as simple as a play mat can help our child’s development needs. Let’s begin with what exactly baby play mats are. What are Baby Play Mats? Baby play mats are simple and soft mats. Some mats come with arches to support overhead toys, while some have baby-safe mirrors, lights, music, etc. Some mats simply provide a soft and safe place for a baby to lay around doing what babies do best, act like a baby. The best thing about these play mats is that they can be used from day one up till they start crawling. Some babies even enjoy them even beyond that age. But what is that makes these mats so special? After all, we are talking about a soft mat. 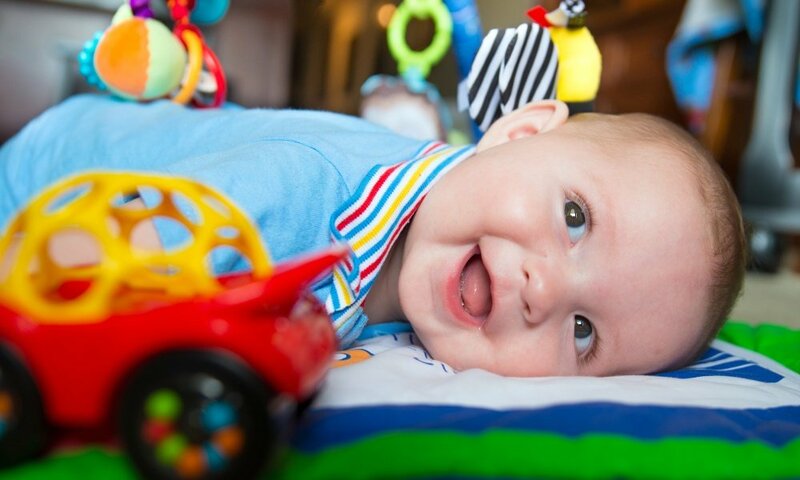 At such an early stage, babies need different stimuli to activate various parts of their brain. These usually come in the form of bright colors, music, and a moving toy, nothing special. Baby mats are designed to provide these stimuli in a safe and nurturing environment. Let’s look at some of these development benefits in detail. All babies are pretty nearsighted. Meaning, they can’t see objects far away from them. At most, they can visualize objects at a distance of about eight to twelve inches. Baby mats provide a healthy way to expose them to various colors and shapes right next to their face. This plays a huge role in developing visual perception capabilities. Babies in their earliest development stage can see human faces and objects with bright contrasting colors. Aside from spending time with our little ones, we can aid in their development by getting them a baby play mat, which bright contrasting colors and designs. They usually start developing depth perception around the age of four months, which is when we see them playing with and trying to grab onto toys. Newborn babies can’t really reach out to something and grab onto it. Yes, your baby does grasp your finger but that is due to their reflexes, and they don’t have any control over it. For example, if you press something in a baby’s palm, they will instinctively grasp it. Play mats help a baby’s development in this department as well. It allows them to visualize what they are grabbing on to and with time understand basic cause and effect as they shake toys and see it move. Around the age of five or six months babies start to grasp objects voluntarily instead of reflexively. Our younglings also demonstrate another form of reflex where their arm extends towards wherever their head turns, at the same time the other arm bends towards their head. This is how babies develop hand-eye coordination. Similarly, there are some reflex behaviors babies tend to exhibit, and these play mats are designed to enhance their development. Motor skills are actions that involve our babies using their muscles. Gross motor skills are movements involving the entire body such as crawling or turning over. Have you heard of the term tummy time? Tummy time represents the time a baby spends on their tummy while awake. It helps strengthen their back, neck, and muscles. It plays a huge role in developing gross motor skills. A play mat makes this process immensely enjoyable for a baby. Since babies have to lie on their tummies to look at the colorful mat, it helps develop some important skills including gross motor skills and visual skills. Many play mats are equipped with baby-friendly mirrors, which babies can spend their time looking at. Babies develop the ability to notice themselves in a mirror around the age of three to five months. They usually smile when they look at themselves in the mirror, which slowly develops into more complex baby behavior. All of these skills are extremely important for their development and self-awareness. Play mats provide the perfect opportunity for babies to develop these skills in a fun and playful environment. Sensory stimulation is among the few means of interaction for babies, especially during the first year of their lives. Baby play mats are designed specifically to offer a wide variety of sensory stimulation such as different textures, colors, and sounds. All of these things help keep a baby’s mind engaged and stimulate growth. Now that we’ve understood why it is important to get the best baby play mat for our little bundle of joy, let’s take a look at some baby mats on the market. Baby Care Play Mat is large one-piece play mat for babies. The size of the mat is important because as babies grow, they start to roll or crawl around and hence, the need for a large enough mat for them to be able to move around. The size of the mat is equivalent to a queen-sized bed, which is in a way like a jogging track for babies. The feature that defines this play mat is its surface cushioning. Since we’re talking about babies, there is nothing more important than safety, which essentially means cushioning. According to the company, the play mat’s cushioning, or padding is so thick and soft that if an egg fell from a high of 10 feet, it wouldn’t break. Aside from the cushioning, the texture on the surface is perfect. It has a patterned texture on the surface, which provides a baby with the perfect amount of grip they would need to start trying to move themselves. Also, despite the patterned surface, it is soft enough not to bother a baby’s extremely sensitive skin. It is also extremely easy to clean. We all know babies tend to be messy. If nothing else, we still have to clean their spit-ups. All you need is a damp cloth and a simple wipe to clean the map. It is designed according to babies and all of their cute and messy proclivities. Last but not least, the play mat is free from all forms of known toxic and harmful chemicals. For example, it is free from lead, phthalate, latex, BPA, EVA, and formaldehyde. Moreover, it complies with the strict European Toy Standards, EN71. Double-sided design for baby’s play and a sober design for home decor. Doesn’t have any attachments for toys. Tiny Love Meadow Days Super Mat is a high-quality large sized play mat for babies. It was designed specifically with a baby’s developmental needs in mind. All of the fun activities offered by the play mat help babies in their natural learning process. It is the best way for a baby to discover the wonders that await them. Since babies grow fast, the large size of the play mat is ideal as the baby won’t outgrow the mat very quickly. Also when the baby starts to crawl around, they will have enough room to move around while still being in the safe confines of the play mat. The play mat is heavily padded to provide a comfortable and safe environment for a baby to learn to move around. You won’t have to worry about your precious baby getting hurt as the play mat is cushioned enough to break any falls on its soft and comfy surface. The play mat, despite its large size, is quite portable. The play mat is designed to be easily foldable. It folds in an easy-to-carry compact size, which makes it an ideal choice if you intend to take the mat with you to your outings with the baby. For example, you can take the mat to a part of the beach for the baby to have a safe and comfy place to play around. The patterns, design and the texture of the play mat were carefully chosen to be engaging to a baby and its development needs. For example, highly contrasting colors on the play mat help a baby develop their visual perception skills and also their motor skills as they get their daily tummy time. Lastly, we have the toys. The play mat comes with a heavily padded baby-safe mirror, which helps a baby develop self-awareness as they watch reflection in the mirror. It also has an extremely cute carrot teether, which can help soothe a teething baby. A vital feature that every parent will appreciate. Hape Baby Folding Play Mat is an amazing play mat for babies aged three months and above. It is a double-sided play mat with different print designs on both its sides. This provides variety for a baby and keeps them engaged for longer. On one side, it has an elaborate railways scene crisscrossing green areas. On the other side of the play mat, there is a jungle setting with various friendly looking animals, all of them smiling at the baby. Its bright and contrast colors will keep your baby engaged for hours at end. The play mat is free from all forms of toxic substances, including BPA. The foam used for cushioning is made of non-toxic PE foam. The play mat is designed to speak curiosity in the mind of a baby and help them learn in a healthy and inquisitive environment. The fat is designed to be quite easy to clean. You can simply vacuum and wipe it with a damp cloth and a quick shakedown, and it is clean. Also, you can simply roll it up into a compact size and store it easily. It has a slippery surface, which makes it difficult for babies learning to crawl. The mat tends to curl of from the sides. Hopefully, by now you are perfectly equipped to find the best baby play mat for your little one. As for us, we will have to determine which of these three play mats stand out the most. Based on all of the information we covered on the importance of play mats, we know that nothing is more important than a play mat that is designed to help babies learn and grow. This is why we are like the Baby Care Play Mat – Haute Collection so much. No, it might not be the perfect play mat, but is there such a thing? In all of our decisions, there will always be some opportunity cost to our decision. However, we still feel confident in saying that despite its price, it is still by far the best option for your baby. It has a double sided design for both decoration and the baby for when he feels like playing. It’s free of toxins and harmful substances so you don’t have to worry about any health issues. These are just a handful of its benefits. This is why I urge all of you to give it a look!